The AV35, the newest model in the wire series of EDM machines has been featured at IMTS. In the standard version the ONA AV35 and the ONA AV25 incorporate a micro-fine surface finish generator that achieves excellent surface finishes in the region of 0.1 microns Ra. The AV35 has X-Y-Z travels of 600 x 400 x 400 and U-V travels of 120x120mm. 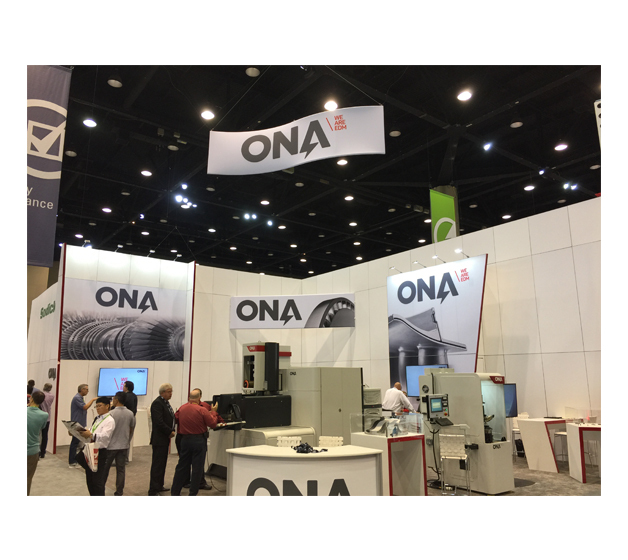 ONA also displayed in its booth at IMTS its QX4 Series sinker line of EDM machines. The QX4 Series was produced with ONA's new High Speed Sinker EDM process technology to increase machine productivity for both existing and new applications. It works with advanced materials such as titanium-based alloys, ceramic hard metals, moldmax, High Nickel Alloys and others. The system decreases electrode wear and can be used for high aspect ratio cavities in aero-energy materials and the mold industry. Application oriented and very flexible, the new 100% Digital Generator allows for quick technical development for specialized applicarion. This Digital Generator was designed with the Aero/Energy and Medical markets in mind. In Addition, IMTS is the place where ONA introduced its MF5 Micro Hole EDM, which is a machine that drills holes from .004"- .020" in diameter.This machine is used as a production machine in the injector, aerospace and medical industries.